The Kimball Union Academy boys’ soccer team competes against many of the top teams in the New England Class A and B Prep School Soccer Leagues. 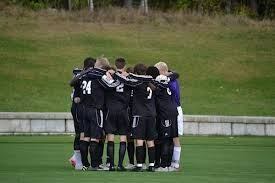 The 2013 team’s success (winning the Lakes Region title and reaching the New England Class B Semifinal tournament), showcased the Wildcat’s soccer prominence in the region. Since winning the Class B New England title in 2007, the Wildcats have returned to the post season five of the following six seasons and have won the Lakes Region Soccer title five times. The boys’ soccer program at KUA offers four competitive inter-scholastic teams. The varsity team traditionally boast a diverse representation of players local to the school’s region and from around the globe. In the past ten years, players have come to KUA from five African countries, six European nations, four Asian states, and six countries representing South and North America. Many of KUA’s former players have played and continue to play at many top DI, II, and III schools. Recent graduates have played at the following colleges and universities: Harvard, Dartmouth, North Carolina State, Hobart, Trinity, Bowdoin, St. Lawrence, Bates, and Wheaton. The wildcats improve to 12-2-1 with a 2-0 win over Exeter Academy. Goal scores for KUA were Tucker Williams and Ben Tardiff. Assists went to Dominick DaCruz and Ethan Barrett. KUA played a complete game limiting Exeter’s chances. Kosta Maniatis was strong in bet for the wildcats when needed. KUA hosts Vermont Academy at 2pm on Saturday 11/10. The Wildcats scored two first half goals and one in the second half to post a 3-0 win over Andover Academy on the road. Junior Ethan Barrett and senior Noah Spaulding scored the first and second goals of the game with senior Seth Stadheim scoring the 3rd goal off a corner at the 62 minute mark. Assists went to Ethan Barrett and seniors jon Schafer and Dominick DaCruz. KUA is now 11-2-1 on the season and host Exeter Academy at 4:30 on Wednesday 11/7. KUA Wildcats were tied 1-1 at the half with Berkshire on a goal from junior Ethan Barrett assisted by junior Wyatt Intrator. Berkshire went on to score 2 unanswered goals to seal the victory. Wildcat keeper Kosta Maniatis made 7 saves and played an outstanding game. KUA is now 9-2-1 on the season. KUA Wildcats beat New Hampton School 4-1 in a Lakes Region League match up. Goals were scored by Jon Schafer, Colin Lewis, Wyatt Intrator and Ben Tardiff. Assists went to Tardiff, Lewis and Noah Spaulding (2). KUA is now 8-1-1 on the season and hosts Tilton Saturday 10/20 at 4:00pm on Pope field. KUA Wildcats scored 3 first half goals enroute to a 4-0 victory over the Tilton Rams. Ben Tardiff, Wyatt Intrator, Max Gesner and Ethan Barrett scored the goals and khenrab Norgay (2), James Surgenor and Tardiff picked up the assists. KUA improves to 9-1-1 on the season and travels to Berkshire on 10/24 for a 4pm match. First half goals by Dominick DaCruz, Colin Lewis and Wyatt Intrator gave the Wildcats a 3-0 lead at halftime. Brewster cut the lead to 3-1 only to have Seth Stadheim answer back to push the lead back to 3 goals.Brewster scored another one late in the match to make the final 4-2. Junior Ethan Barrettt picked up 3 assists on the day with the other assist going to Tucker Williams. KUA is now 6-0-1 on the season and travel to Proctor Academy Friday night for a 6:00pm start. KUA got on the board first with a goal 35 minutes into the first half when Junior Ethan Barrett found Senior Ben Tardiff in the box who one-timed the service home. St Pauls responded just 5 minutes later to tie the game at one. Tardiff scored his second of the game, this time finishing a cross from Junior Colin Lewis as the first half was just about to expire. The Wildcats made it 3-1 at the 77 minute mark when Senior Khenrab Norgay found a loose ball in the box and slide it past the St. Pauls keeper. KUA is now 4-0-1 on the season and hosts Holderness at 6pm on Friday 10/5. KUA wildcats traveled to Brewster to open the Lakes Region League season. After a scoreless first half, and a couple quality saves from KUA's Kost Maniatis, junior Colin Lewis scored his first goal of the season,. Lewis finished a header at the back post off a service from senior Jon Schafer at the 55 minute mark. Brewster and KUA traded opportunities over the 35 minutes, with Brewster evening the game at the 87th minute mark. Both teams played well and the result was a fair result. KUA is now 1-0-1 on the season and will travel to Loomis on Sunday Sept. 23rd for a 2pm game versus Nobles. A 1984 graduate of Binghamton University, Michael Doherty comes to KUA from the Oliverian School, a small independent boarding school in Pike, New Hampshire, where he served as Director of Admissions for three years. Head Men’s Soccer coach for twenty years at Colgate University, he was named the Lanzera National Coach of the Year in 1992, the Patriot League Coach of the Year for 1992 and 1997, and NSCAA Regional Coach of the Year, also in 1992 and 1997. He has won two Howard Hartman Awards as Colgate’s coach of the year and served as an Instructor in Colgate’s physical education department, teaching racquetball, tennis, and weight training. He has been involved with various youth sports boards of directors (hockey, soccer, lacrosse, baseball), coaching and volunteer positions, and was the Managing Director of the Lightning Soccer Club from 2007 to 2009. Mike lives on campus with his wife Judy and children Pat, Shannon, and Jack. He enjoys the outdoors, fishing, hiking, and Sudoku puzzles. After two years in KUA's Admissions office, Mike was appointed Director of Athletics in 2011.